I’m getting many requests for a written pattern for this market bag. I didn’t have one, so I decided to make it. In the last fortnight I have been crocheting this market bag, writing down the pattern for it, just to make sure I have got the pattern right, I crocheted another market bag based on my pattern. I didn’t realize how time consuming it is. I do have a great admiration for those of you who are writing patterns on regular bases. The pictures are to help guide you through the crocheting, and supporting the written pattern for this market bag. I have added charts as well. It may be even helpful to learn reading the charts. As you can see, I have also attempted lining the bag. That proved to be very tricky as well. I know that my patterns are usually for free, but on this one due to the time and effort spent on it, I have had to provide this one for symbolic price only, and you can find it HERE. Today I would like to share with you one very special owl I made for my little daughter. We have got the same problem every day. When I’m trying to style her hair I never have enough or the right hair clips handy. They are always all over the place. So I came up with this hair clip holder. I’m secretly hopping my daughter will be more motivated to clip them on the owl before she takes them off. It would make life so much easier for me every morning. Size: The owl on the picture is around 11cm (4,4”) in diameter, cca 12cm(4,8”) high, the ribbon cca 45cm (18”). 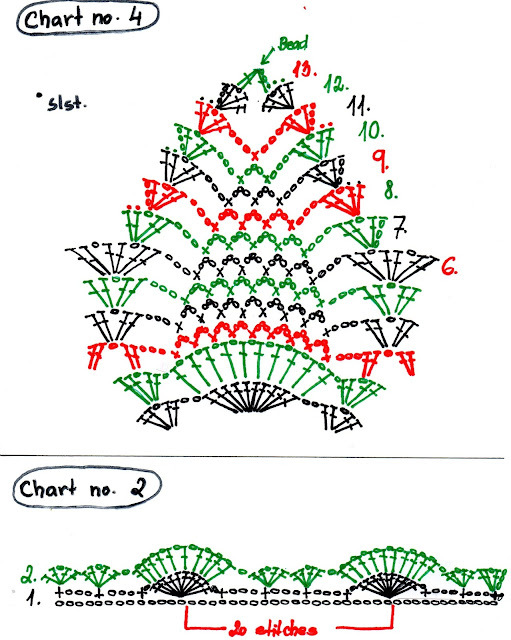 It is worked in circular crochet method, beginning at centre. Slst. join at end of each round. Don’t turn, but continue in same direction until instructed otherwise. Begin with magic ring, ch3 (count as dc), 15dc’s into the ring. (16dc’s). Do not turn. Ch3 (count as dc), dc into same st., 2dc’c into every next st. (32dc’s). Do not turn. Ch3 (count as dc) – 2dctog. in same st., dc in next st., *3dctog. in next st., dc in next st.* around. (16-3dctog./16 dc’s). Do not turn. Ch3 (count as dc), dc into same st., 2dc’c into every next st. (64dc’s). Do not turn. This row increase evenly 11 dc’s (roughly every 6th dc). (75dc’s). Do not turn. Do not cut the yarn. Ch4 (count as tr), tr in next st., dc in next st., dc in next st., hdc in next st., sc in next 10 st., hdc in next st., dc in next st., dc in next st., tr in next st., tr in last st. (20 stitches). Turn now!!! Ch3 (counts as dc), dc in next 2 st., hdc in next st., sc in next 3 st., slst. in next 6 st., sc in next 3 st., hdc in next st., dc in next 3 st., (20 stitches). I used a (crab stitch ) all around the owl as you can see on the pictures. You can find the tutorial on Youtube. Begin with a magic ring, ch3 (count as dc), 15dc’s into the ring. (16dc’s). Begin with a magic ring, *ch3 – 2dctog. – ch3 – slst. into the ring*, repeat 3 more times (4 tiny petals). Ch5, 4 tr into 5th ch from the hook. (5tr). Ch 4 (counts as 1 dc, ch 1), * 1 dc into ring, ch 1 *; repeat 5 more times. Join with a slst. into 3rd ch of the ch-4 made at the beginning of this round. (7 ch-1 / 7dc’s). Fasten off. Join the color into any of the ch-1 spaces, ch 1, *1 sc, 3 dc, 1 sc* into the same ch-1 space; repeat 6 more times into next ch-1 spaces. Join with a slst. into the first sc of the first ch-1 space. (7 petals). *ch 3, sc into the stems of the next 2 scs *; repeat 5 more times, ch 3, and then sl st into the first ch of the ch-4 done at the beginning of this round. ( 7 ch-3 spaces/loops behind each petal made in round 2). Join the color into any of the ch-3 spaces/loops. Ch 1, *1 sc, 4dc, 1 sc* into the ch-3 space, repeat 6 more times into all ch-3 spaces; sl st into the first sc of the first petal made in this round. (7 petals behind the first 7 made). Fasten off. The main crocheting is done now. Sew the white eyes with black buttons, beak/nose, and tiny flower with button. and other decorations on the owl’s body now. Cut the back out of cardboard. (I just pressed the owl onto the cardboard and drew around it). It should look like the one on the picture below. Secure the ribbons on the cardboard as you can see on the picture below. I glued the ribbons and stapled them as well, just to give it extra strength. Glue the owl to cardboard now. You can adjust it before it dries completely. Sew the bigger flower onto the end of the ribbon. It looks pretty and it holds the ribbon down as well. You can add some hair to the ears if you like. Now it’s up to the little girls to do they job. I certainly hope the excitement will last. So far the hair clips are on it, but in the future only time will tell. We got so exited about this project, that we made one more owl. I used the leftover felt I had from the Christmas angels, and made a felted owl holder as well. As you can see, there are so many variations. The size really depends on the type of material and size of hook you are using. You can vary the size by using a different type of material and size of hook. The one I made (on the picture) is cca 80cm (32”) long and cca 95cm (38”) around the hips. I used 300g – 350g of acrylic yarn (It’s better if you are using yarn with some elastic in it – it’ll give the skirt a nicer form, than 100% cotton. It will make the skirt fit better as well). Note: Please read all the instructions first, so you can choose which way you want to make your skirt. At first I made 8 pineapple squares. One square measures cca 12cm (4,8”). See the chart bellow. It is all depending on size of your skirt. The pattern can be use for any even or odd amount of squares. 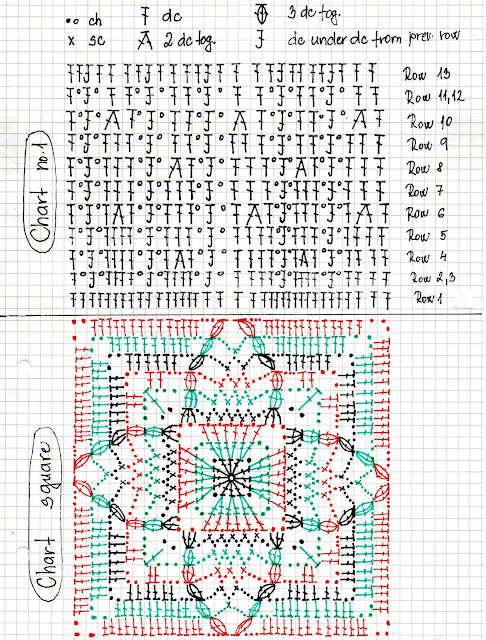 When I had all the squares I needed, I sewed them together – backstitch only. The other option is to join them together with sc’s if you like. You should end up with sort of circle made out of squares. Work the top of the skirt in rounds. Do not turn. Slip stitch on end of each round. “chart no.1” you can see above, how to make the top of the skirt. After row 1 following this chart you should have 280 dc’s around. And just keep following the chart. Fasten of. Weave the ends. 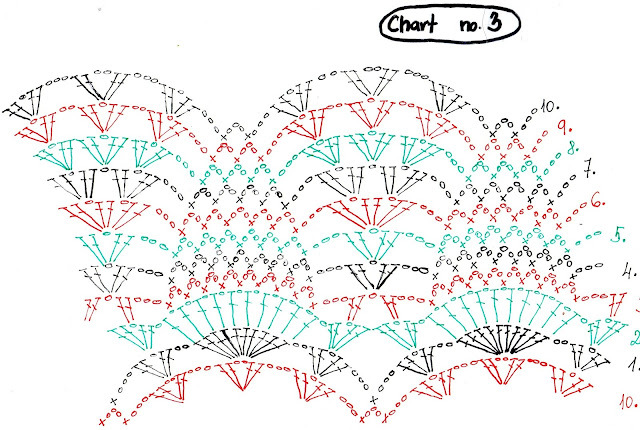 “chart no. 2” you can see below. After finishing row 2 work rows/rounds 3 – 10 from “chart no.3” below. Afterwards repeat rounds 1-10 from “chart no.3” as many times as needed to obtain the length of the skirt you desire. Finish your work on lower part of the skirt with round 6 of the “chart no.3” – you should have 14 unfinished pineapple motives. Fasten of. Weave the ends. Now we are going to be finishing the pineapple motives. Start each pineapple motive from the right side of the skirt/work. From now on you’ll be turning your work back and forth on the end of each round!!!! Follow the “chart no.4” above. Start with round 7. As you can see on the pictures I added a little bead on end of each pineapple. That is optional. I just thought it would look nice to put a drawstring with pineapples through the top of my skirt. It can be used to hold the skirt up if needed as well. To do it, I used the pattern for earrings you can find here. There it is. You should have nice skirt now, or an inspiration for one at least. To my knowledge this is as best way I can explain how to make this pineapple skirt. I hope you can understand me, however if you come up with any problems or difficulties, write to me, and I’ll be more than happy to help, or explain further.